College football season is here, and you know what that means! Saturdays are now reserved for friends, family, and football. While watching the big game at home with friends and family is fun, it can also be exciting to sit at your favorite restaurant or pub, rooting on your team with dozens of other individuals who are just as excited as you are! If you’re looking to go out and about in Destin but don’t want to miss out, here are three spots to watch the big game in Destin. Football fans may disagree over whose team is better, but one thing they can all agree on is that AJ’s Seafood & Oyster Bar is perhaps the number one place to watch football in Destin. WIth an open observation deck, Tiki bar, and multiple big screen TVs, it’s hard to say no to a night of football at AJ’s! Enjoy specials on oysters, beer, and other beverages while you watch the big game. Harry T’s Lighthouse is known for serving “seafood, spirits, and sunsets,” but they’re also known for one of the best places to watch football in Destin! Located at HarborWalk Village, you’ll be able to spot the restaurant from its iconic lighthouse. Catch the game at any angle with the numerous big screen TVs throughout the restaurant while enjoying delicious food and amazing views of the East Pass. Plus, Harry T’s offers great food and drink specials all day long, as well as one of the best Bloody Marys on the harbor! Competing in the ranks among well-established Destin restaurants is Tailfins Seafood House, Oyster, and Sports Bar. Three levels of decks each feature wide bars, 70″ flat-screen TVs, and a menu with everything you could imagine. Plus, Tailfins’ jumbotron is the perfect way to immerse yourself in the game. It’ll truly make you feel like you’re at the stadium! Drink specials go from 10:30 AM – 6 PM, so you can enjoy bloody marys and craft beers all day long. In addition, there’s nothing like watching a game from your very own vacation condo on the beach! 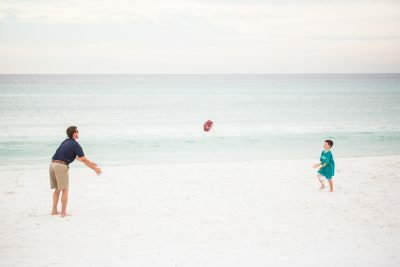 Southern Vacation Rentals offers Destin vacation rentals with flat-screen TVs, panoramic views, and more. Book one today to find your spot on the beach!